I’m also hosting a giveaway of the book with 3 winners. But more about that later on. I’ve always loved reading kids books. I’m a big kid at heart! They are quick and easy reads when you have some spare minutes. In fact it took me just an hour to read Chloe’s Secret Princess Club. I love the pink sparkly front cover. It’s that perfect book for your little princess. The book introduces us to Chloe, a natural-born dreamer. Her head is away in the clouds most of the time so she’s misses what’s going on around her. One day she heads home from school with a very disappointing mental maths score in which her obnoxious twin brother Arther is quick to point out. You see while the test was going on, Chloe was dreaming again. Her parents know what Chloe is like and her mum tells her that she can be anyone she wants if she only puts her mind to it. Chloe takes this as meaning she can be a real princess. She includes two friends, Aisha and Eliza into her secret and they all form the secret princess club. All three of them come up with their own princess names, secret tasks to undertake and make sure they have lots of sleepovers. I enjoyed reading along with all their tasks and any little girl would really enjoy this book. I love the little extras the book includes such as the jam tarts recipe as the back of the book in which the princesses make in the book. Also a little quiz and a how-to guide on starting your own princess club. I’m very happy to give Chloe’s Secret Princess Club 5 out of 5 stars. Here is the list of other bloggers on the Chloe’s Secret Princess Club blog tour. Why not pop over the next week and read all our reviews. Now onto the exciting part! *I was given this book in exchange for an honest review. All thoughts and opinions are my own. 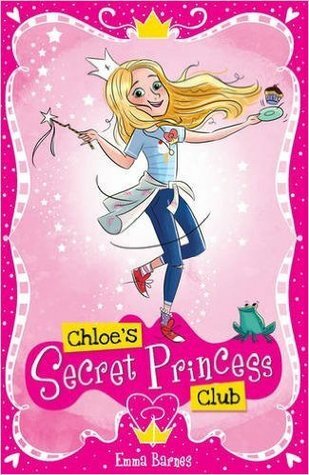 *Terms and Conditions – There are 3 copies of Chloe’s Secret Princess Club to giveaway. The prize is non-transferable and no cash alternative will be offered. The winners will be selected at random via Rafflecopter.com from all valid entries and be notified by Twitter. The winners will have 14 days to respond with a valid address before a new winner is selected. Open to all UK and IRL entrants aged 18 or over only. Facebook and Twitter are in no way associated with this giveaway. Hetty Feather by Jacqueline Wilson. My daughter would love this book! At the moment she is reading Olivia the Orchid Fairy from the Rainbow Magic series. My nephew is reading ‘The Gruffalo’ at the moment. Mimi the laughter fairy – my daughter is mad about rainbow magic! My 7 year old daughter is reading Matilda by Roald Dahl. I have just started the eldest on the James Herriot books, starting with It Shouldn’t Happen to a Vet. She seems to be enjoying them. Currently getting through the Roald Dahl collection. Twits at the moment! At the moment they are currently reading Horrid Henry’s big bad book. The Witches by Roald Dahl! My son is reading George’s Marvellous Medicine. Charlie and he chocolate factory! My Little one is reading ‘The Gruffalo’ at the moment.